A scientific paper written by video-gamers has been accepted for publication in a peer-reviewed journal, perhaps the first time since the days of Benjamin Franklin that work led by non-credentialed “citizen scientists” will appear in such a format. The paper describes a new set of rules, derived intuitively by players of a video game called Eterna, for determining the difficulty of designing desired structures composed of RNA molecules. Unlike previous crowdsourcing efforts for which scientific experts have reached out to online gamers, the gamers themselves took the lead in this paper. Three experienced Eterna gamers distilled their community’s ideas into online Google documents and then contacted expert researchers at the Stanford University School of Medicine and elsewhere to independently test their ideas using high-performance supercomputers. The final paper is a condensed version of the gamers’ own documents. Once dismissed as a relatively boring component of living cells, RNA is now understood to underlie virtually every critical process in biology and is increasingly appreciated as a potential medical and industrial tool. While each RNA molecule begins its existence as a linear chain of subunits, it quickly folds into a thermodynamically stable shape that depends on the molecule’s particular sequence of component subunits. That shape, in turn, dictates which cell components the RNA molecule will interact with and how. Scientists’ improving ability to computationally model and design RNA raises the promise of a new generation of RNA-based therapies customized to specific cancers, viruses, neurological abnormalities and inherited disorders. 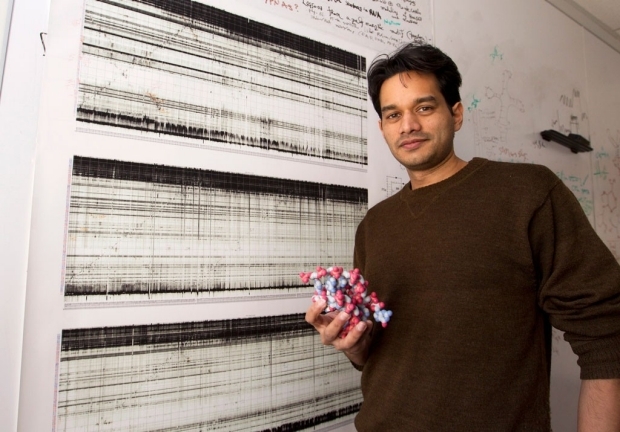 The paper, which will also appear in March in a special print issue of the journal devoted to RNA design, signifies an evolution of how crowdsourcing can impact scientific discovery, said its senior author, Rhiju Das, PhD, associate professor of biochemistry at Stanford. The paper’s research was not guided or collated by expert scientists, as has been the case in prior work from Eterna and other scientific discovery projects, but by the non-experts in the gaming community. “It’s important to capture these insights and make them both public and credible via publication in peer-reviewed journals,” he said. One striking finding of the Eterna consortium (known as the Eterna Massive Open Laboratory): RNA molecules that are symmetrical, pleasing to the eye and that fold stably are also hard to design; the more symmetrical the desired shape, the more difficult to achieve it. It’s important to capture these insights and make them both public and credible via publication in peer-reviewed journals. Launched in 2011 by Das and Adrien Treuille, PhD, an assistant professor of computer science at Carnegie-Mellon University, Eterna now boasts more than 100,000 registered players, said Das. The interactive online video game challenges players to design chemical sequences of RNA that fold stably into desired shapes. Sequences that look promising in terms of their thermodynamic stability — as predicted by algorithms whose job it is to assess this feature — are synthesized in Das’ laboratory and tested to see what structure the RNA sequences actually assume. Anyone age 13 or older can register to play by going to the game’s official website, Eternagame.org. No special skills or biochemistry training of any sort are required. “It’s not even necessary to know what RNA is or does,” Das said. Until now, there has been no established rating scale for RNA-design difficulty, Das said. A biomedical researcher is not able to easily assess the difficulty of designing an RNA structure for a diagnostic or therapy, and therefore may waste significant time and money trying to create difficult or near-impossible shapes for an RNA molecule to assume. Even though attaining a rating scale for RNA design was not the mission of Eterna, experienced Eterna gamers noted how useful such a difficulty rating would be in guiding new players from easier to harder “puzzles.” These experienced gamers took it upon themselves to compile a list of particular features that render RNA shapes difficult to design sequences for. They carried out tests using their own personal computers. They then contacted scientists in Das’ lab with a set of predictions to test their ideas — a set of 100 hypothetical RNA shapes that experienced Eterna players rated from relatively “designable” to nearly “intractable.” The scientists used Stanford supercomputers to test these predictions against a half-dozen standard algorithms developed for the purpose of supplying RNA sequences that fold into specified shapes, and they found that the players’ rankings correlated strongly with the algorithms’ ability to solve these puzzles. Indeed, the hardest puzzles, which could be solved by experienced Eterna players, were not solvable by any of the algorithms even when given numerous days of computer time. In some cases, these now-confirmed intuitions overthrow conventional thinking in the RNA-design community about which designs are likely to be attainable and which intractable, Das said. For instance, “the players discovered on their own, and the algorithms independently confirmed, that the more symmetrical a requested structure is, the harder it will be to design,” he said.